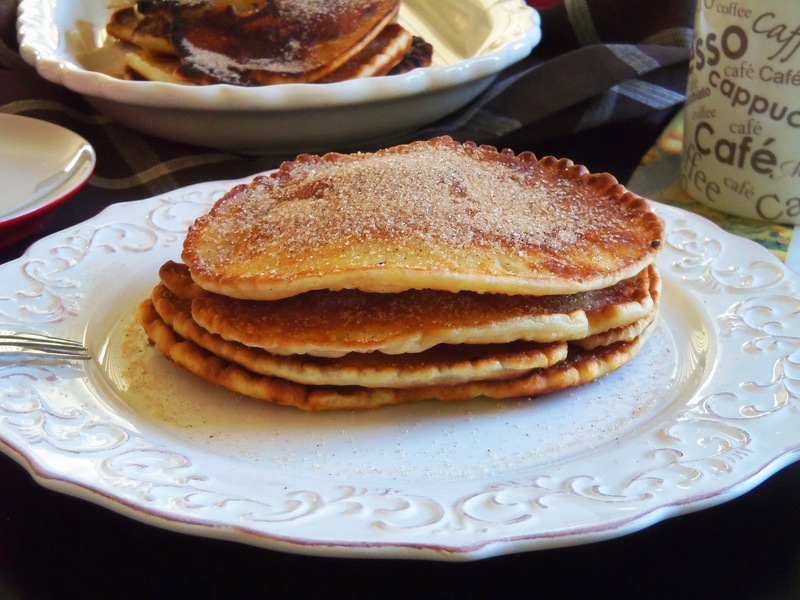 It’s time we talked about pancakes! 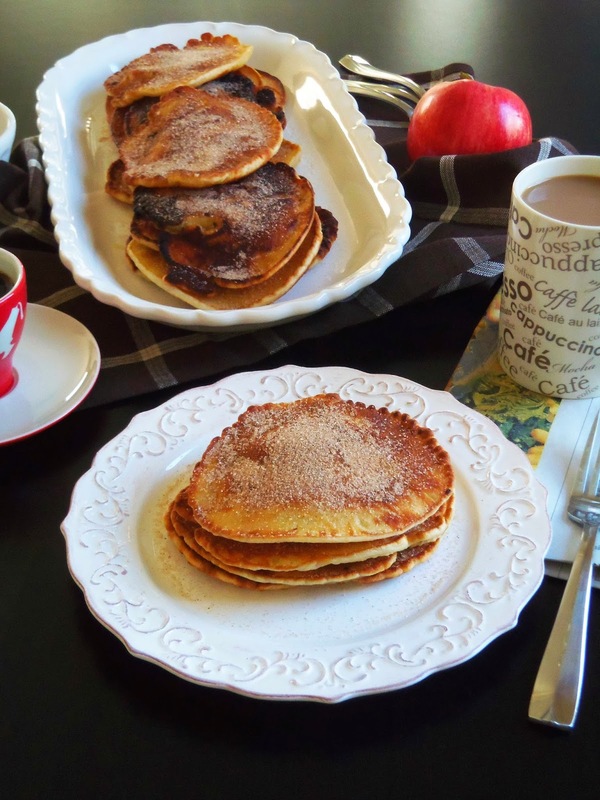 While pancakes are traditionally considered a breakfast staple in the States, Romanians see them as an unceremonious yet utterly tasty, usually-mid-week-kind of sweet. Or at least that’s what they are in my family. 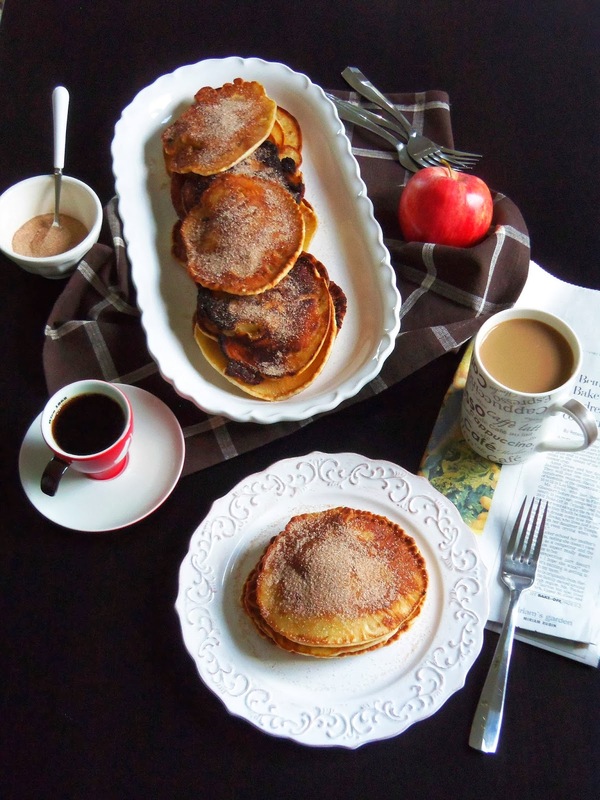 Yes; in my grandma’s home, pancakes are always a mid-week-jackpot dessert, fairly similar to French crêpes but lacy and soft, and usually stuffed with sweet, jammy fillings including homemade apricot preserve or with sweet cheese and raisins on occasion. 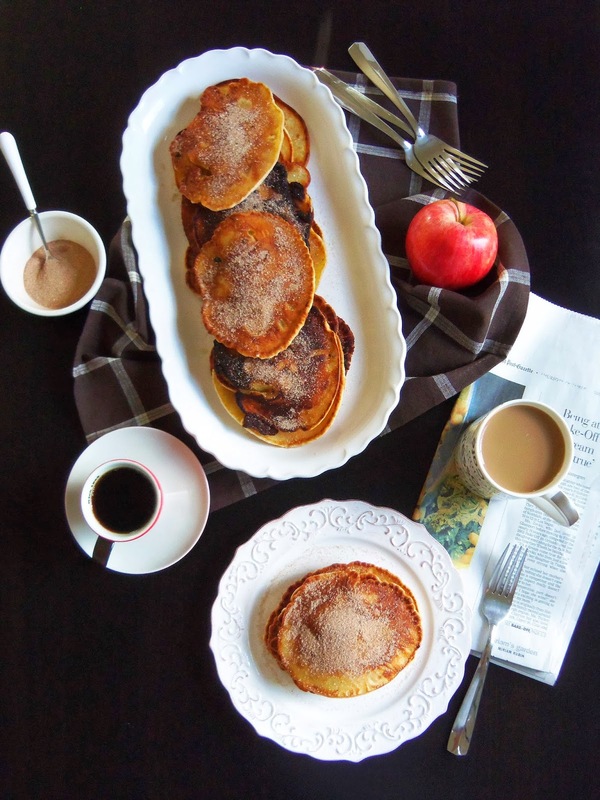 And then, there are these delightful Apple Pancakes, a traditional Saturday sweet treat in my grandma’s kitchen! With fall in full swing, markets are flooded with apples and I’ve loaded up on my fair share of this season’s favorite fruit. My apple of choice is honey crisp and I’ve stocked up on it like there’s no tomorrow. There’s something decisively sublime about its pleasant balance of tart and sweet that other apples don’t quite possess. 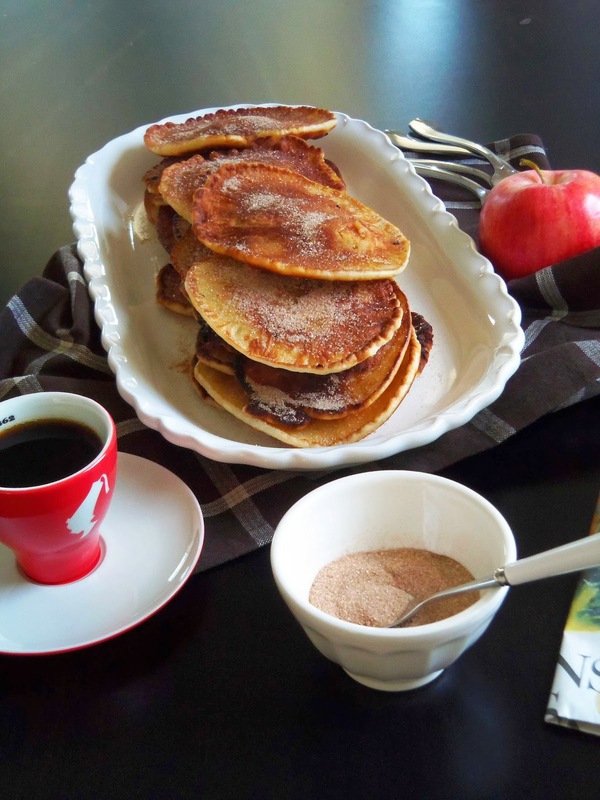 So, what better way to showcase their sweetly crisp flavor than in light and cottony apple pancakes? 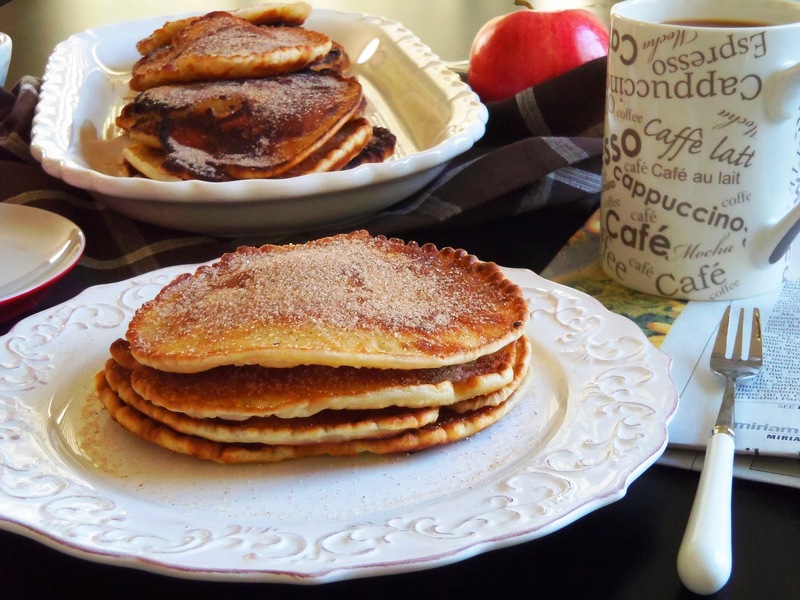 These apple pancakes are neither thick nor spongy, but are nothing short of brilliant either. They are simple, little pockets of tender, pillowy dough that effortlessly hold tart and crisp pieces of apple. 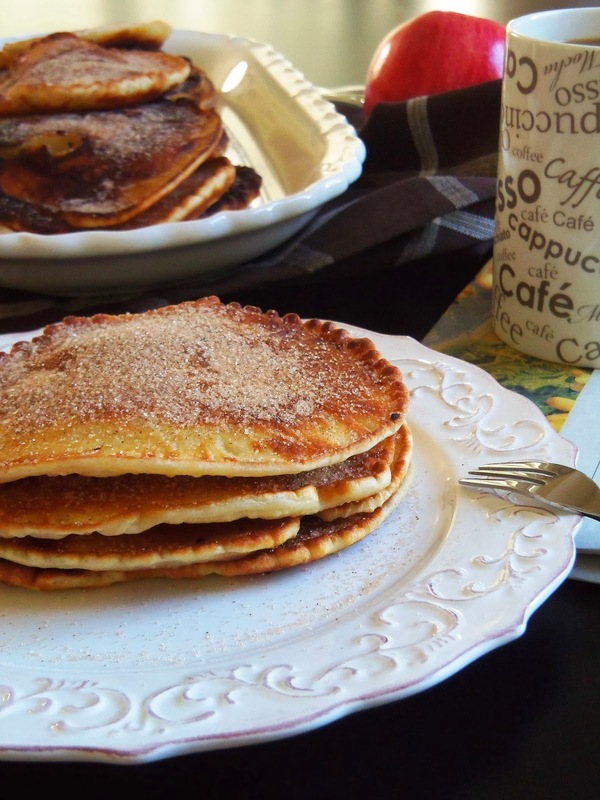 Once out of the sizzling skillet, the pancakes are lightly dusted with nicely perfumed cinnamon-sugar that gently turns into a thin, caramelized glaze as it melts, nestled in between the blistering pile of golden pancakes. 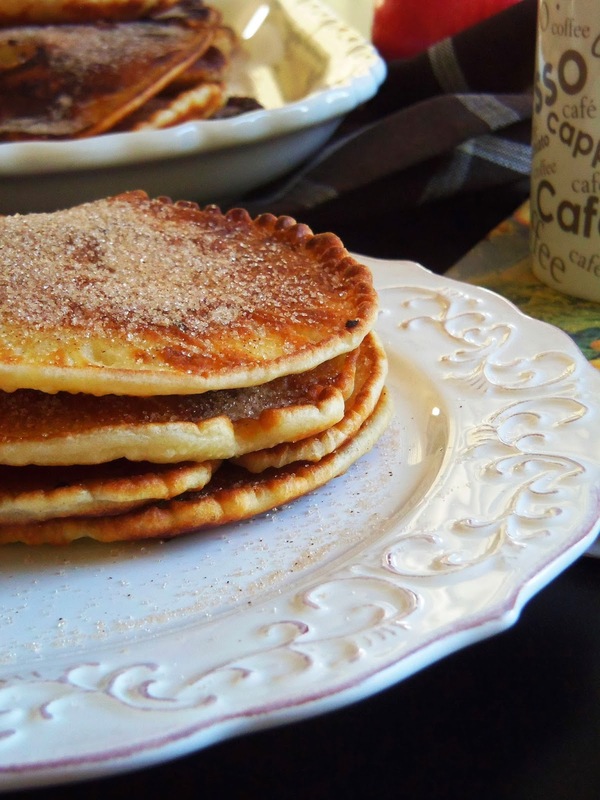 The best part – they are mighty fabulous for a relaxed dessert, and impossibly delicious with a generous drizzle of maple syrup for a satisfying breakfast. 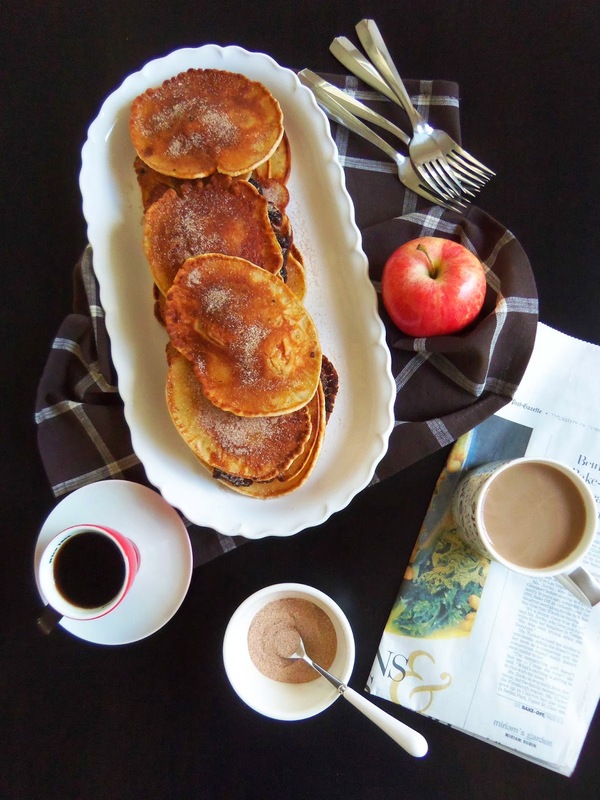 And truth be told, there’s nothing more inviting and comforting than the charming aroma of freshly cooked apples and steaming pancakes invading every little corner of the house on a cold, fall day! 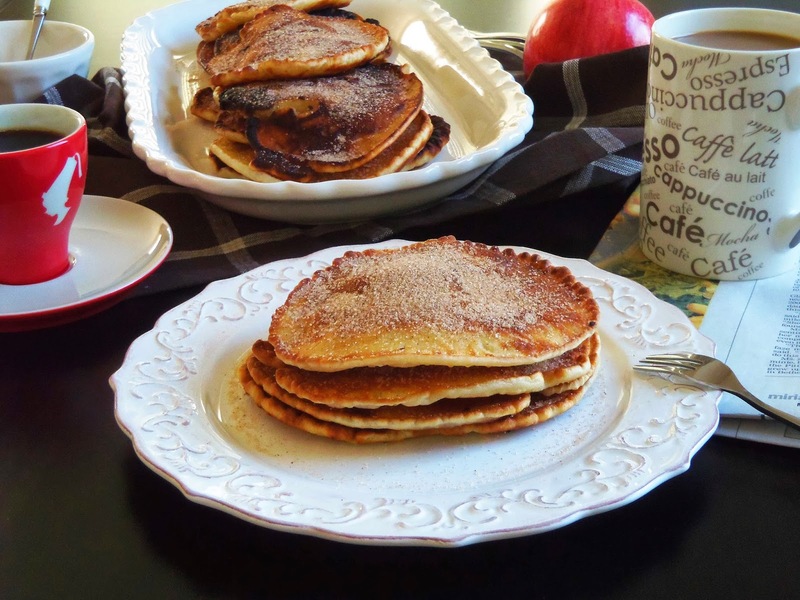 Before I leave you with this delightful recipe, I’m overdue with a proper and very big “Thank You!” to the incredibly talented Carla Sue, who writes at the wonderful and sinfully sweet blog, Eat Sweet. 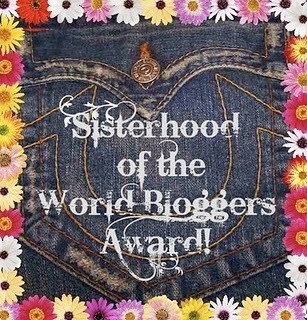 Carla Sue has nominated my blog for the Sisterhood of the World Bloggers Award! I’m deeply honored, excited and lucky to be considered for this lovely award by a fellow blogger and friend who lives half a world away and whose sweet words, creations and gorgeous pictures always leave me drooling and hungry for more! Again, thank you so much for nominating me, Carla Sue! 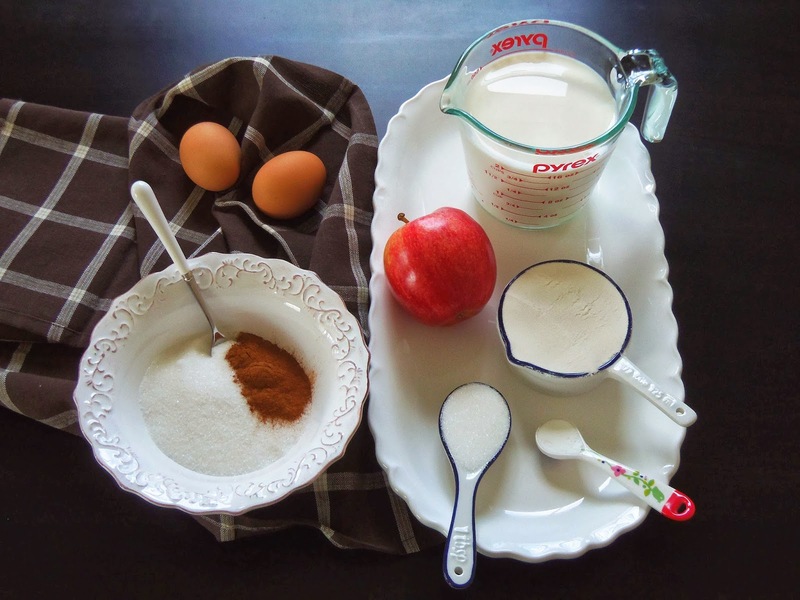 In a large bowl, whisk together milk, eggs, sugar, salt and baking powder. Gradually, add the flour to the milk and eggs mixture stirring constantly until the flour is fully incorporated, and you have a slightly thicker batter without any lumps and traces of flour. Add the sliced apples and gently mix them into the batter. In a nonstick skillet, heat about 1 ½ teaspoon of olive oil over medium heat. 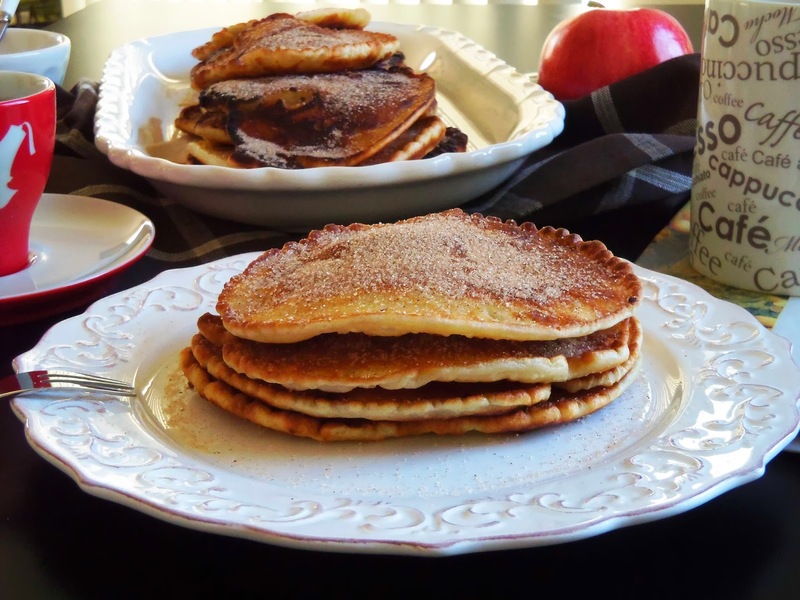 Fill a 2.5-inch ladle with the pancake and apple batter (have 2 pieces of apple per pancake) and gently pour it into the pan. Cook pancake for 1-2 minutes per side until golden-brown. Repeat with the rest of the batter adding about 1 teaspoon of oil per pancake. If the pan gets too hot, turn the heat down to medium-low.